Quite a lot of review copies showed up this week along with a nice big package from Night Shade. Descriptions are in italics. 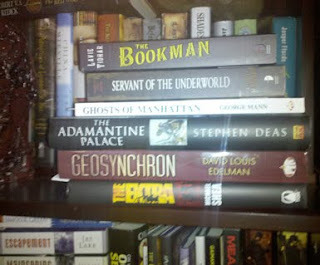 The Bookman by Lavie Tidhar - This is my second copy as I had pre-ordered it and Angry Robot sent me a copy along with the next book. After reading some of Lavie shorts and his recent guest post I'm eager to get at this. Servant of the Underworld by Aliette de Bodard - Really intrigued by this one, which would be only the second Fantasy book I've read using Aztec mythology. de Bodard has done some wonderful short fiction and has been gain quite a name the last year or two, but this is her debut novel. Year One-Knife, Tenochtitlan the capital of the Aztecs. The end of the world is kept at bay only by the magic of human sacrifice. A Priestess disappears from an empty room drenched in blood. Acatl, High Priest, must find her, or break the boundaries between the worlds of the living and the dead. Aliette De Bodard is the hottest rising star in world SF and Fantasy, blending ancient crimes with wild imagination. Ghosts of Manhattan by George Mann - One of my most highly desired titles here as I love the premise of a Steampunk superhero in 1920s NYC. 1926. New York. The Roaring Twenties. Jazz. Flappers. Prohibition. Coal-powered cars. A cold war with a British Empire that still covers half of the globe. Yet things have developed differently to established history. America is in the midst of a cold war with a British Empire that has only just buried Queen Victoria, her life artificially preserved to the age of 107. Coal-powered cars roar along roads thick with pedestrians, biplanes take off from standing with primitive rocket boosters and monsters lurk behind closed doors and around every corner. This is a time in need of heroes. It is a time for The Ghost. A series of targeted murders are occurring all over the city, the victims found with ancient Roman coins placed on their eyelids after death. The trail appears to lead to a group of Italian-American gangsters and their boss, who the mobsters have dubbed ‘The Roman’. However, as The Ghost soon discovers, there is more to The Roman than at first appears, and more bizarre happenings that he soon links to the man, including moss-golems posing as mobsters and a plot to bring an ancient pagan god into the physical world in a cavern beneath the city. The Adamantine Palace by Stephen Deas - I've been hearing wonderful things about this book for ages from my UK cohorts so I'm glad Roc is giving it a good push here. The finished cover is gorgeous. Geosynchron by David Louis Edelman - The final book in the Jump 225 Trilogy again featuring art from the always impressive Stephan Martiniere. In this case it will be a little while before I get to it as I still have Infoquake staring at me from my mountainous to-read pile, but this will probably be the push I needed to get to it sooner. The Extra by Michael Shea - World Fantasy Award winner Shea dusts of a short from the 80s in the first in a trilogy. It looks to be a large scale Running Man type story where movie extra are put in disaster roles and if they survive they get a payday and a chance to get out of the hell that LA has become. At first I wasn't sure if it was something I'd like, but the idea is growing on me. 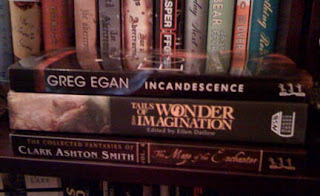 Incandescence by Greg Egan - Looks to be a hard sci-fi novel, but relatively short so I may fit this in between some of the doorstoppers. The Maze of the Enchanter: The Collected Fantasies of Clark Ashton Smith vol. 4 - The prolific Ashton has been quite well regarded for decades for his early work in Fantasy, but I must admit to never having delved in. Maybe this will bring me into the fold. Tails of Wonder and Imagination edited by Ellen Datlow - One of the best anthologist tries for something a bit different. At first I wasn't interested, but perusing the stories it looks to be a strong collection with some very familiar names. Wow you have some good sounding books there! I read my first Steampunk novel, Boneshaker, not long ago and would like to read more. Ghosts of Manhattan sounds like it would fit the bill! I see a couple of others here I would like to try. Ghosts of Manhattan should be a good one. Boneshaker is one of my favorite Steampunk novels now and it time it will probably be considered a classic of the genre. If you want to try more find The Alchemy of Stone by Ekaterina Sedia and my wife had lovely things to say about Clockwork Heart by Dru Pagliassotti.